LinkedIn shares surged 109% on its first day of trading. NEW YORK ( TheStreet) -- LinkedIn ( LNKD shares soared 109% before closing at $94.25 Thursday, marking one of the few IPOs in the post-dot-com era to double on its first day of trading. Since 2001, there have been only six companies that have posted triple digit gains in their share prices, according to Renaissance Securities, an IPO research firm. The business-oriented social network opened at $83 -- double what it was priced at late Wednesday -- on its first day of trading on the NYSE. 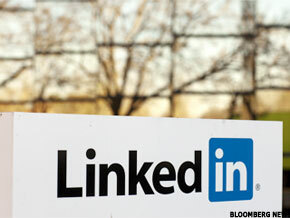 LinkedIn sold 7.8 million shares, or 8% of the company, netting it $351 million. The company priced its shares at $45, the high end of its expected range. It's now valued at over $9 billion -- far above the $2.5 billion it commanded in the secondary markets just a few weeks ago. Enthusiasm surrounding LinkedIn's offering proved investor's appetite for social networking companies, helping other pre-IPO Internet companies like Facebook and Groupon gauge their worth in the public markets. Using LinkedIn's current valuation as a comparable metric-- 600 times its 2010 earnings of $15.4 million -- Facebook would be worth around $360 billion in the public markets. The company reportedly earned $600 million in net income last year. However, it remains unlikely that Facebook and others will speed up their IPO timelines on account of LinkedIn, said Ira Cohen, a managing director at boutique investment bank Signal Hill. "All of these big companies looking to go public are doing it methodically and they're in no rush," he said. Given the scarcity of tech IPOs due to a variety of factors including lessons learned during the dot-com bust, LinkedIn's IPO represents somewhat of a turning point for the tech sector. The Web 2.0 firm has already commanded lots of early-stage investor interest. Shares of LinkedIn were trading at $12 as of July 2009 on secondary market SharesPost, and crept up to $31 as of March. The firm raised the expected price range of its IPO by 30% on Tuesday in response to a surge in investor demand, to $42 to $45 a share, up from $32 to $35 a share. For some tech skeptics, LinkedIn's valuation isn't reasonable. Where will LinkedIn shares close on Thursday, May 26? "I don't feel like the internal financial dynamics justify that kind of valuation ... it just doesn't make a lot of sense," said Wesley Paul, a partner at Michelman & Robinson who works in the firm's corporate and securities department. Others caution that like shares of recently-public tech firms Renren ( RENN - Get Report) and Demand Media ( DMD, LinkedIn's stock may come crashing down to the earth in the next few weeks despite the early hype. The share price of Renren, the so-called Facebook of China, soared almost 30% after its IPO earlier this month before dropping below its offering price a few weeks later. "All of these companies are subject to the laws of physics, so long-term, companies will be valued on the basis of earnings," said Tim Keating, president of Keating Investments, which makes investments in pre-IPO companies. "While it's encouraging to see this high valuation for LinkedIn, the company is going to have to justify it." During the after-hours session, LinkedIn was trading down $1.86% at $92.50.